There is no parking available at our offices. The best car park is on Goldsmiths Lane, which gives you 2 hours’ free car parking. Exit at junction 12 and take the A4 towards Theale/Reading. At the roundabout take the 3rd exit onto the A340 to Pangbourne. Continue onto the A329 through Streatley and Moulsford. At Winterbrook Roundabout take the 2nd exit onto Reading Rd. Continue onto St Mary’s St and turn left at St Leonards Square, continue onto St Martin’s St. 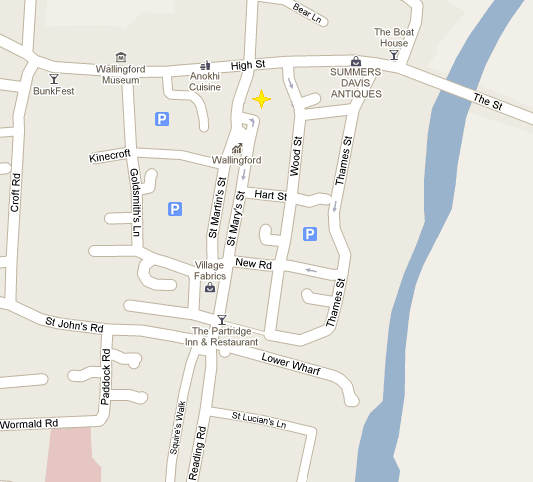 This is the centre of Wallingford – you will need to find a car park. Get the train to Cholsey or Didcot. Buses go roughly every hour on the hour from the bus stop in Cholsey around the corner from the station on Papist Way, and from outside Didcot Station. Alternatively taxis are always available outside Didcot and can be called to meet trains at Cholsey.